Hello everyone and welcome to CottageCutz by The Scrapping Cottage Sneak Peek Day 1. For the next three days we will be sneak peeking some projects for you. 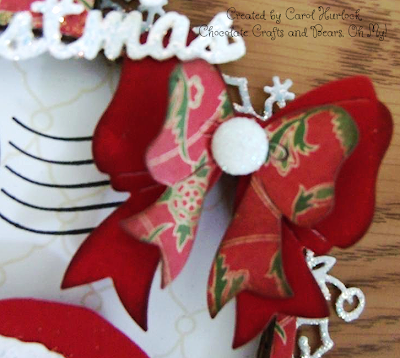 We are super EXCITED to share with you projects using some of the CottageCutz dies and stamps from a special release called "Homemade Christmas Gift Set". There are 21 universal dies and 7 clear stamps in this box giftset. I have to admit that when I opened this up I was totally WOWed by what is included. So for today and tomorrow the CottageCutz design Team members will be showing sneak peeks allowing you to see some of the CottageCutz dies and stamps for this release on Sunday September 8th with the new Homemade Christmas Gift Set box. On Sunday we will reveal the whole project for you. You are just going to fall in love with these dies. Thank you for joining us today for Sneak Peek Day 1 with the CottageCutz DT. Please be sure to join us tomorrow Saturday the 7th of September for more Sneak Peeks! I know this is going to be good....Christmas goodies! Yea!!! I looove Cottage Cutz ~ can't wait for the new release! what a pretty bow...cant wait to see the full set! Sounds like a generous, amazing box set! Love the bow!! I saw the finished product first since I was so late in commenting but it is fun to see the details up close too! Hugz!